Sheffield United’s under-18’s produced a gutsy performance, laced with moments of real quality, to beat Coventry City in the Professional Development League Two play-off final. Jordan Hallam’s first-half goal put Derek Geary’s side on the path to victory in front of a sizeable crowd at Bramall Lane and ensure a season, which has seen them go undefeated since December, deservedly finished on a positive note. Tyler Smith came within a whisker of doubling their advantage after the break but City’s Lewis Green produced an acrobatic clearance. United hoovered-up trophies last term with their first, ladies and ladies reserves teams all winning their respective divisions. 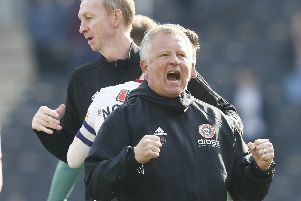 Geary’s squad completed the quartet by finishing 14 points ahead of second-placed Sheffield Wednesday in the competition’s Northern Section but, as the Irishman observed on the eve of this game, were desperate to cement their position on a nationwide stage. Hallam nearly handed them the perfect start when, after bursting into the box straight from kick-off, he was upended by a defender only for the referee to wave play on. It was a controversial decision but one the teenager ensured did not alter the overall outcome. City, the Southern Section champions, entered the fixture with the same ambitions as United but attempted to fulfil them in a subtlely different way. Whereas the hosts looked to pick their way through the midfield area, the visitors appeared more dangerous when they adopted a more direct approach. It made for an intriguing battle of wit as well as will although a poor back pass nearly presented City with a clear chance midway through the opening period before Hugo Warhurst cleared-up the mess. At the other end, Smith, one of the stars of United’s semi-final victory over Charlton Athletic, shot wide before failing to convert Rhys Norrington-Davies’ delightful cross. But Smith redeemed himself by creating the opening for Hallam to break the deadlock in the 39th minute; unleashing a powerful drive which Konrad Skuza could only parry into the centre-forward’s path. Hallam went close again soon after the interval, firing just over after a corner had been dragged back to the edge of the box. Sheffield United under-18’s: Warhurst, Charlesworth, Norrington-Davies, Gilmour, Graham, Cantrill, Smith (Greaves 90), Slater (J Ford 86), Parkhouse, Hallam, Hirst (Hawks 76). Not used: Perryman, Ferguson. Coventry City under-18’s: Skuza, Green (Crowther 82), Camwell, Eccles (Doyle 90), R Ford, Thompson, Hickman, Bayliss, Ponticelli, Finn, Stedman. Not used: Banatyne-Bilison, McMahon, Green.